Sitting down to a good cuppa is not what it used to be. Gone are the days of a cup of traditional black tea with a dash of milk and teaspoon of sugar. Instead we have hibiscus, white dragon, rose and French vanilla flavours – all growing in popularity as young and old embrace the tea culture. A novice tea drinker can get lost in all the different leaves. But tea merchants are on hand to explain the subtleties of tea and encourage more consumption. Acupuncturist turned tea merchant Peter Markwell stocks more than 110 different flavours at his Camp Hill Herbal Tea shop and said he had seen a rapid increase in the popularity of tea. “Popularity of tea is increasing so much. Everyone’s got the coffee culture – they’re now looking for something different,” he said. Similarly, Nundah’s Queenie’s Tea House founder and owner Julie Clissord said tea was becoming more and more popular and its drinkers were embracing new flavours. “People are getting more adventurous with trying teas,” Mrs Clissord said, although she pointed out Brisbane tea drinkers still had a long way to go. According to global business research group Datamonitor report Hot Drinks in Australia to 2013, the Australian tea market is expected to reach a value of $473 million in 2013. Tea consumption in Australia currently stands at 0.8 kg per annum per capita and is expected to rise quickly in the next few years. The report also attributes tea’s increasing popularity to the perception that it is healthier than coffee. Mr Markwell said stressed people particularly benefit from the soothing process of making tea. And while tea bags are convenient, he criticised the “double-dunk and done” method of making tea. He said getting people to stop working for 10 to 15 minutes was half the battle against stress. “All of a sudden they’ve got to sit there… They cannot concentrate on work things,” he said. Mrs Clissord said she constantly reminded customers to “brew it not stew it”. “A good quality tea made well is always better than a good quality of tea made badly… It’s not rocket science but it is a science,” she said. Other benefits of tea include the anti-oxidant levels – which are higher in lighter coloured teas. Both the tea merchants we interviewed said the beverage could be used to benefit a person’s health. This includes peppermint tea for digestion, ginger for circulation, some teas even assisting weight loss. However, Mr Markwell was quick to remind people they still had to work out after drinking tea. “People are drinking these weight loss tea bags all day and they don’t know… you have to actually exercise,” he said. Other misconceptions include the temperature of teas. “Most people won’t drink green tea because they say it tastes really bad. That’s usually because they’re burning it,” he said. The optimum water temperature for green tea is 60 to 70 degrees. But tea drinkers should experiment with the flavour of teas until they found their favourite. “You can mix and match anything,” he said. The Queenie’s founder agreed and said she hoped to educate people in the different forms of tea. 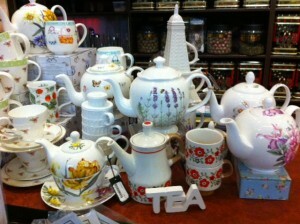 “I try to educate the world one customer at a time to let people know how they can get the best tea,” Mrs Clissord said. She said she hoped genuine iced tea, “not that commercial lolly water,” would grow in popularity in Queensland’s hot climate and that restaurants would stop offering English Breakfast after dinner. She encouraged everyone, men and women to try tea. “It’s not a highbrow thing,” she said.